Landsat 7 image mosaics used in Google Earth™, top: NaturalVue™, bottom: TruEarth®. Google™ once again wowed web users worldwide with its release of Google Earth™ (external link). This product allows users to have a bird’s-eye view of almost any place on the planet. Google Earth™ is a free desktop Geographic Information System (GIS) with satellite imagery covering all of Earth’s landmasses. The program seamlessly integrates map information, varying resolution satellite data, and terrain information. Where available, Google Earth™ features high-resolution satellite images (~1 m), however, over the vast majority of Earth’s surface, the highest-resolution data available is Landsat 7 ETM+ pan-sharpened data (15 m). 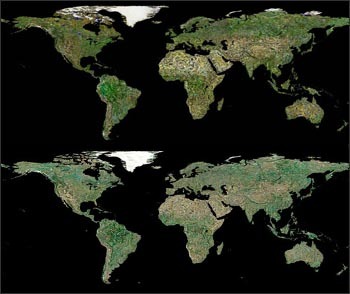 In 2000, NASA sponsored the creation of an orthorectified Landsat 7 ETM+ mosaic of all of Earth’s landmasses, circa-2000. The Landsat data used for this project were collected between 1999 and 2002. This was part of the GeoCover project and orthorectified Landsat mosaics circa-1970 and 1990 were also created. EarthSat (now part of MDA Federal) was contracted to orthorectify the Landsat data and to create the color-balanced mosaics. NASA requested a pseudo-true color mosaic using ETM+ bands 7,4,2. During this time, EarthSat also created a circa-2000 Landsat mosaic called NaturalVue™. NaturalVue™ uses the five lower spectral bands of Landsat 7 plus the panchromatic-band to create imagery that approximates natural color (with a proprietary algorithm). This data set was originally used as the Google Earth™ base map. On March 23, 2006, Google Earth™ announced its switch to TruEarth® for the Google Earth™ base map. TruEarth® is a TerraMetrics® product also made from orthorectified Landsat 7 data. TerraMetrics® produced TruEarth® using its proprietary natural-color processing. Tucker, C., Grant, D., and Dykstra, J. NASA’s Global Orthorectified Landsat Data Set. (PDF, 1 Mb),Photogrammetric Engineering & Remote Sensing, v. 70, pp: 313-322.